The annual Māori Pastoral Care Appeal takes place on the weekend of 24-25 August 2019. Donations can be made at anytime during the year to Monsignor Gerard Burns and Deacon Danny Karatea-Goddard, PO Box 1937, Wellington 6140, New Zealand. Msgr Gerard Burns writes about Māori Pastoral Care …. They say humans are the only animals that can make promises. I think that’s true: promises to keep a secret, marriage vows, religious vows, baptismal promises, legal contracts, and so on. The Marist family has just been celebrating 200 years since a small group in Lyon made a great promise to found a religious project taking on the way of being of Mary, the mother of Jesus as a way of spreading the Gospel. When that project got papal approval many of the early members of that group were sent to New Zealand to carry out their promise. Here with Bishop Pompallier their first promise was to work among Māori. Religious sisters and lay people also took on that promise. The mission has been carried out in various ways by many dedicated people across Aotearoa in parishes, schools, marae, home, hospital and prison visits. Māori themselves have taken up the work. Assisting parishes, schools and communities with their knowledge of things Māori, use of te reo Māori in liturgies. Helping with sacramental and leadership programmes for children and young people. Providing opportunities for Mass in Māori. Assisting participation in Archdiocesan events, liturgies and celebrations. 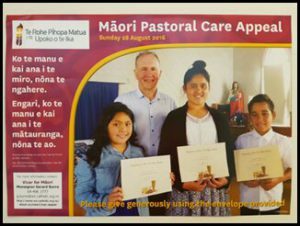 The Māori Pastoral Care Appeal collection will take place on the fourth weekend of August each year. Your parish may have an envelope through which you can make a contribution. Some parishes have a special second collection for this purpose. Thank you for helping the Church to keep its commitment to Māori, to the Treaty of Waitangi – Tiriti o Waitangi – and to the Gospel.